So already we're halfway through February, and once again life gets in the way with its busy to-ing and fro-ing of stuff to do, things to do, people to see, places to go. So here's a belated Happy New Year! to you all. 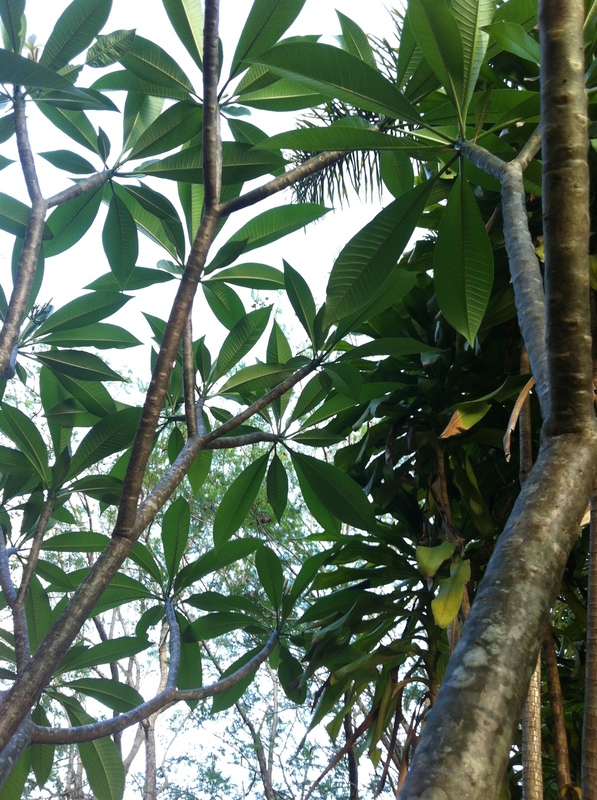 1 week in the life of a Frangipani Tree. Even thought that's the title of the experiment, I seem to get very distracted by life and it actually was a 17 day exposure in the end. The camera was donated by my good friend Helen in Sydney, a Glenfiddich vessel (a robust cardboard tube with tin ends) - which I didn't expect to last in the weather (hence the short exposure time). In fact we had the worst deluge we'd had in 2014 in the first 4 days the camera was up. So I was expecting a waterlogged mess on the film. I suspect however that the cardboard may have worked in my favour, soaking the water and re-distributing it back to the outside world, instead of slushing around inside the camera making royal mincemeat of my image! Because I ended up with a marvellously cool image of the frangipani leaf shapes contrasting spectacularly with the background lightness of the sky. Named her "Frangipani Dreams" as she seems so dreamy (don't ask me why my images have a gender sometimes). Stay tuned for more high contrast nature-y type images in 2015, as I have a current obsession with shapes, contrast and texture. Kindly people donate their vessels to me all the time to turn into pinhole cameras (thanks peeps!). This one is an old Glenfiddich vessel (heavy duty cardboard cylinder with tin lids top and bottom). I was hoping to achieve something like this view with this camera and exposure time. This is the eventual image which came out. Originally was only going to be a week - life got in the way. Again! So this exposure was 17 days.